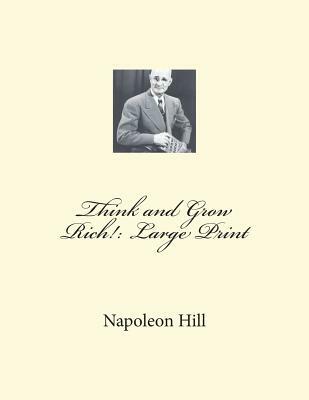 Think and Grow Rich by Napoleon Hill The greatest motivational book of all time Napoleon Hill's thirteen step programme will set you on the path to wealth and success. Think and Grow Rich reveals the money-making secrets of hundreds of America's most affluent people. By thinking like them, you can become like them. Inspired by Andrew Carnegie's magic formula for success, this book will teach you the secrets that will bring you a fortune. It will show you not only what to do but how to do it. Once you learn and apply the simple, basic techniques revealed here, you will have mastered the secret of true and lasting success. And you may have whatever you want in life. This book has sold millions of copies and has helped millions achieve success and stands as a monument to individual achievement and is the cornerstone of modern motivation. It is the all time best-seller in the field, giving Napoleon immense influence around the globe. This is a reproduction of the original 1937 edition, which is now in the public domain in the U.S. We are delighted to publish this classic book as part of our extensive Classic Library collection. Many of the books in our collection have been out of print for decades, and therefore have not been accessible to the general public. The aim of our publishing program is to facilitate rapid access to this vast reservoir of literature, and our view is that this is a significant literary work, which deserves to be brought back into print after many decades. The contents of the vast majority of titles in the Classic Library have been scanned from the original works. To ensure a high quality product, each title has been meticulously hand curated by our staff. Our philosophy has been guided by a desire to provide the reader with a book that is as close as possible to ownership of the original work. We hope that you will enjoy this wonderful classic work, and that for you it becomes an enriching experience.